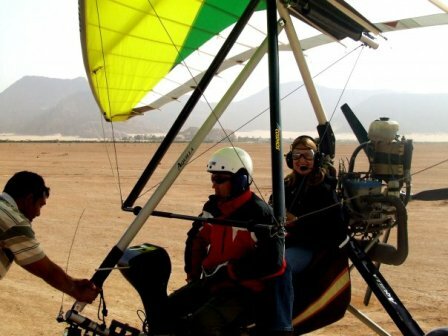 The ultimate adventure: Microlight Flight in Wadi Rum! If you think Wadi Rum is beautiful wait until you fly high above it with a lightweight aircraft. No special skills or qualifications needed - just sit back and let your experienced pilot show you what only birds can see. 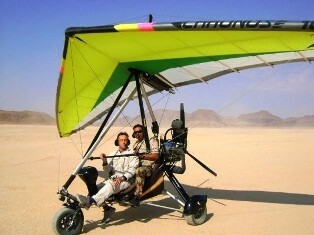 Microlight Flights in Wadi Rum are offered by The Royal Aero Sports Club of Jordan. With this lightweight aircraft you will cruise at speeds of 80 to 90 km/h at altitudes of 1000-1200 meters which is ideal to take superb photos of the beautiful rock formations and sand dunes. Although flying is considered an extreme sport, you do NOT need extra insurance in order to try a microlight flight in Wadi Rum. - third party insurance, passenger accident insurance, etc. Microlight flights take place between 7.00h and 11.00h in the morning. One flight lasts 20 minutes to 1 hour, upon request. A 10-minute flight costs JD 30, a 20-minute flight costs JD 55 and a 1-hour flight costs JD 150. Fee to be paid to the pilot. Only 1 passenger at a time. 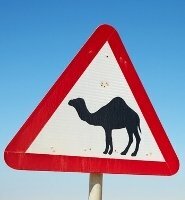 The pilot can pick you up from any campsite in Wadi Rum, as you arrange with him. Use the booking form below. Helmet, eye protection and a headset that allow communication between the pilot and the passanger are provided by the Club. Wear something warm - a pullover or a jacket and long pants - and proper shoes. Sandals and slippers are not suitable. Cameras must be tighten to your body. Contact the pilot directly and book your microlight flight in Wadi Rum now. Fill in the form below and hit the Send button. Your requestt will be forwarded to the pilot who will respond you in 1-2 days.